1. What projects do I have the supplies for already? From my stash, I have supplies for trousers, tap pants and bra sets, button-downs, a knitted sweater vest, and a couple dresses. 2. When I get dressed every day, what item often fills in the blank in this question, "Dangit! I wish I had ________ to wear today!" For me, this blank has been more and more often filled in with "office-appropriate trousers," "solid button-down shirts," and "non-pencil skirts." 3. Of these items, which are the most versatile that I would wear the most? To continue my personal example, I'd have to say trousers and button-downs. 4. Do I want multiples of any of these projects? Different color/ fabric versions? Could they be made "factory" style to get a bunch done at once? I do want to make several button-downs, but I have to do a test run on the pattern I have and make tweaks before I try making it "factory" style. Then I have the supplies for several shirts ready to go! 5. What events/weather is ahead that I can prepare for? Winter is coming! I need layering clothes! 6. What do I feel like creating and having in my wardrobe? Right now, I would love to be able to use some of my feedback and novelty print fabrics to make button downs, some of them mostly solid-colored, too. It would give me more layering options come fall, and I'm just REALLY excited to get some of my more exciting fabrics out! Knitting is also a good in-between project for lull times at work or short breaks at home. With all of this in mind, I have begun work on a late 1940s button-down pattern trial run. When it's done, I'll be able to tweak it and *hopefully* do some factory style production of some fabulous blouses! I'm also going to keep knitting a sweater vest that I'm working on. It will pair well with all the future blouses and work well for "winterizing" my wardrobe. What projects are in your queue these days? What do you think you're going to work on next (or currently)? Thanks for sharing your prioritizing process! Oooo, those all sound great! And if you figure out how to make a sloper, I'd love to hear your process! These are great tips. 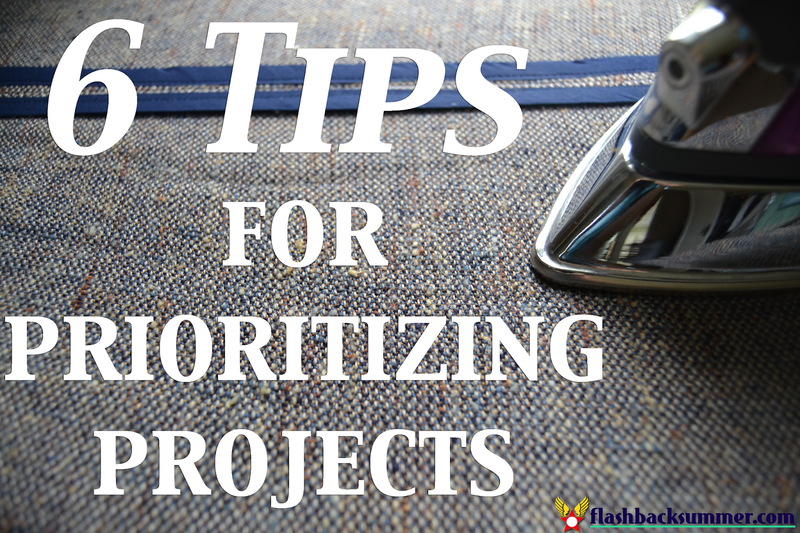 The biggest problem I have, other then finding the time of course, is prioritizing projects. I have so many things I want to work on that sometimes it's really difficult to put them in order of need instead of want. Fantastic, thought provoking post! I too always feel like I have 100 projects/tasks I want to get done for every one that I manage to accomplish (and, goodness, has that feeling been running rampant this year in particular, as it seems I get busier with each passing month, if not week) and it's great to have lists like this to reflect on and help put things into perspective when it comes to making the most out of the finite number of hours any of has to accomplish - at least some of - the many things we want to accomplish. This post has really helped me think about my sewing projects in terms of needs and then wants (and other kinds of projects too). Thank you for putting together these helpful tips, Emileigh! Oh wow, thank you so much!!! I'm going to check it out now! What an honor! This is a wonderful process for prioritizing your projects. I seem to have project ADHD lately, and for every project I get done, I add 3 more to the list. I'll be thinking about this list the next time I question what I should be doing. I do find that it helps me to write down all my projects and try to organize them, rather than having them all float randomly around in my brain.